As mentioned in our earlier post, we offered a range of workshops during our sector forums in Newcastle, London, Bristol and Birmingham. In the latter 3 venues, not all the people at the event could attend all the sessions, so the Taskforce is using this series of blog posts to enable everyone to see the presentations and get a flavour of the discussions that took place. This workshop, evidence based planning, was held a total of 7 times, in 2 locations, and over 80 people took part. The workshop session looked at the development of a toolkit on how to carry out evidence-based, long-term and sustainable planning. This is Action 10 in Libraries Deliver: Ambition - an action led by the LGA. Libraries Deliver: Ambition said library authorities should think long-term as they plan and change their library service, and do this in consultation with their communities. It said they should be looking at how the library service can help meet their wider objectives, taking into account other local service provision both within the area and across council boundaries. During the public consultation on Libraries Deliver: Ambition, people were asked for views on a needs mapping tool. Most responses supported the concept of the need for strategic, evidence-based, mapping and planning. Many also stressed the urgency in providing guidance on this as councils are already making decisions about their libraries. They also emphasised the need for planning to consider cross-boundary issues as well as activity in other libraries (for example in academic and school libraries). This action links closely to the development of the core dataset, and you may also be interested in this blog on that subject. An outline of existing information and where to find it – this could focus on information that libraries themselves will not typically hold, and may find it harder to access. For instance, information relating to levels of deprivation, skills and qualifications, education and employment, and local health data. Guidance on conducting an analysis, with an emphasis on mapping – few library services have direct access to analytical experts, so this section would need to guide users on how to find the right sort of data, and then how to use it, including looking at whether it was available at the right geographic level – such as council level, ward level, or something called a ‘lower super output area’. Ben Lee explored these points in detail later on in the session. 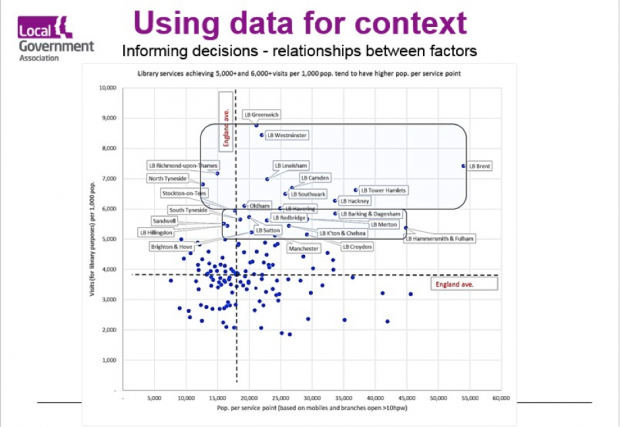 Advice on communicating the findings and discussing them with the public and decision-makers – there is little value in having data that you cannot explain to anyone else, so this section could look at various ways of presenting information, particularly through maps. Once the information has been presented, the audience then needs to be involved in the discussions about how the service can respond to them, and the tool could include an advice section on how some councils have approached this. Ben Lee then took over to provide some examples from his own work of practical evidence-based tools and approaches which can inform decisions when planning public library services to meet local needs. The first set of tools he described were focused on the very local level, in particular the use of ‘heat-maps’ of socioeconomic need based on data from the Index of Multiple Deprivation (or ‘IMD’). IMD ‘heat maps’ can be created using the Government’s free online tool, LG Inform, or councils might prefer to download the raw data and have their own data specialists create heat maps in-house. One of the great benefits of IMD data is that it can be mapped to small geographic areas usually referred to as Lower Super Output Areas. This means we can see the exact location of social need in far more detail than simply using borough-wide, or even ward-level averages. IMD data also enables library services to look at the patterns of different aspects of need e.g. child poverty, low skills, or older people. Here is an example of heat-mapping ‘all-indicator’ IMD - we usually also look at sub-categories such as IMD for child-poverty only. In this map you can see deprivation (darker shading) towards the bottom left. The other great thing about mapping socioeconomic need at this fine-grain level is that library services can then compare the geographic concentrations of need, with geographic concentrations of library users. This is done by mapping the postcodes of active library users to the same geographic level – Lower Super Output Level - to highlight which areas have the highest and lowest concentrations of library users. What this enables library services to do is identify the extent of their reach into the most needy areas of their boroughs – and also to find out whether there are parts of the borough where socioeconomic need is high, but where relatively few residents are library users. 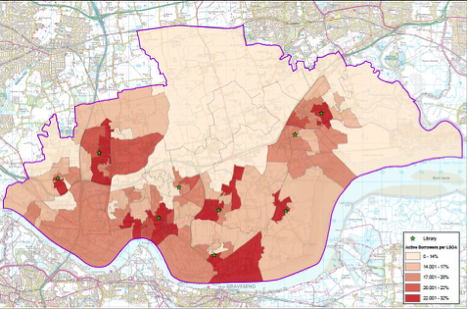 The map below (showing the same borough as the one above) reveals that the highest density of library users is to be found in the same Lower Super Output Areas as the highest levels of socioeconomic deprivation. The darkest shading indicates 22% or more of the population are active library users. In other words those using the library most are also those with the highest levels of need. The same mapping can be done with users of specific services such as library PCs or participants in the Summer Reading Challenge. Services can then be targeted to increase library usage in those areas. Ben then showed how data at the national level can also be used by library services to understand how their reach compares nationally. Here, rather than heat-maps, scatter charts can be used to make comparisons between a service’s own profile and that of other boroughs’. The map below plots all English library services according to the number of library visits they achieve per capita, set against the size of population per library branch. Besides enabling a library service to see how they compare, it also reveals some interesting patterns – for example, many of the library services which have the highest numbers of visits per capita (i.e. those services which get used the most), tend to have larger populations per library branch (i.e. they have fewer branches per capita). Lastly, Ben explained another form of ‘mapping’ which can be used to underpin a sustainable service plan. This was not geographic mapping, but mapping or matching the different elements of a library service’s offer to the host local authority’s strategic priorities. The aim here is not simply to confirm the library service contributes to every strategic priority of the council - it probably does. Rather, the aim is to understand accurately which borough-wide priorities the library service contributes to most through services such as reader development, early years activities, housebound services, digital access, and Books on Prescription. This enables library services to build relationships with those council services they have most in common with (e.g. early years, support for older people, enterprise support, and leisure and arts) rather than being viewed by other services as a Jack of all trades with no specific allies. Having listened to Ben outlining the possibilities for using data, and the current gaps in data being collected, I looked at what data could already be easily found at the national level. I also looked at a free tool that the LGA has produced that allows anyone to compare different types of datasets – library usage, health data, economic and skills data – at a local level. A very detailed, click-by-click guide to using LG Inform can be found here. LG Inform provides a simple way for people to create maps to explain the context of an area and track change over time. For instance, it can be used to show areas with the worst levels of deprivation, allowing services to be targeted in that area. Once the Libraries Taskforce has published its basic dataset with branch locations we will also allow be able to show the locations of libraries on that map. I explained that LG Inform, as a tool that already exists, is planned to form the core part of the planning tool and people at the workshops felt this was a sensible idea. There seemed to be general support for this approach, and some councils shared how they were already collecting data on internet usage, which we feel would be useful for services to do. Two representatives from library software companies also came forward to say their systems could be adjusted quite easily to capture this information for services, which was a very positive first step from the workshop. Lack of capacity to investigate data seemed to be the biggest problem, and a number of delegates flagged that it could take a long time to build a relationship with partners to access the data they held. Having access to national information that could be broken down to a local level will give them quicker access to the information they needed. We are now working hard to pull together the various elements of the tool, following this positive reaction. The action plan for Libraries Deliver: Ambition originally said this would be ready for the end of February, but the increased volume of work that has been identified as being required following feedback from library services has meant our timetable has slipped slightly. We now intend to have a prototype for testing available for volunteer library services by April 2017. If anyone is involved in gathering data now, and would like to help us shape the prototype, please get in touch. In the meantime, the LGA has published a toolkit for councils on working with communities. New Conversations: LGA guide to engagement is a guide for councillors and officers working to build a stronger dialogue between councils and residents. Learning from it will form the basis for the third part of the tool – communicating the findings and discussing them with the public and decision-makers. You are also welcome to explore LG Inform and see how you can use the information already available. If you create any reports from it, please do share them with us at cts@local.gov.uk so we can see how it is being used. If you have any views to share on this topic, please either email the Taskforce or leave a comment below. To keep up to date with Taskforce activities, remember to follow on twitter, or subscribe to the blogs. 1)	At the moment the DCMS / LGA can’t manage to publish the most basic public library information as open data i.e. the CIPFA data. Virtually no data has been published since 2014/15. That is scandalously poor performance by those with responsibility for libraries. Research data like the above may be interesting to some but isn’t timely publishing of basic national and local libraries data a greater priority. 2)	The statement that many of the library services which have the highest numbers of visits per capita tend to have fewer branches per capita is surely only true for urban areas i.e. high density populations with good transport links. It would be useful to understand causation as well as the correlation. Also one wonders how meaningful library visitor data is in the age of the community hub and co-located services. 1. Agree that this is a gap and the Taskforce is working to improve that. The basic dataset was published yesterday and is a good start towards it. We will also be working with CIPFA on their information. 2. Urban areas are certainly highly represented there, but there are also areas without good transport links. We are looking at why that is, because it's not immediately obvious and definitely needs unpicking.